« Time for Latkes (Potato Pancakes)! The second dish uses purple cabbage, joined by yellow beets and orange carrots for a jewel of a salad. Both can add colorful to your holiday meals. Enjoy! Wash and cut or slice other veggies: cabbage, radish, and avocado. Place in a large bowl and toss with olive and a pinch or two of kosher salt (and pepper, if using), mac nut oil or sesame oil. 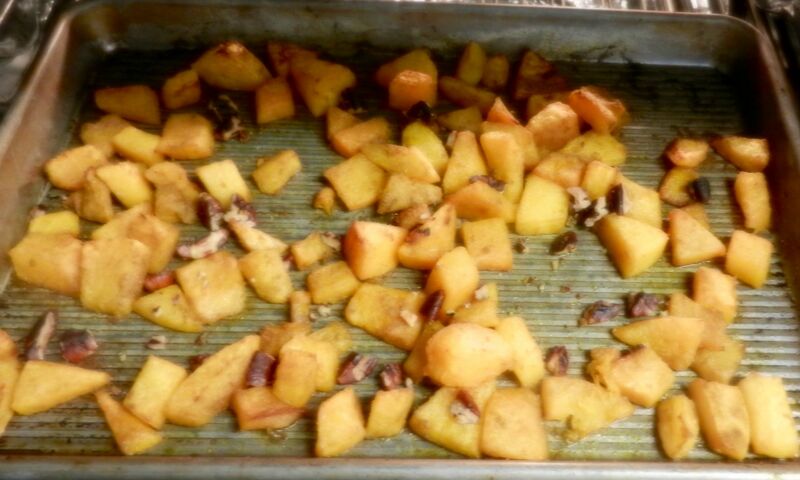 Add cooled squash pieces and toss again. Place the salad on a serving platter, add sliced avocado and garnish with microgreens or jar sprouts (ex, alfalfa, clover, radish, etc. )Serves 2 to 4, depending on what else is on your menu. 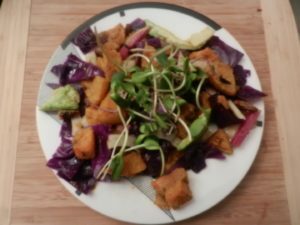 Note: If using the smaller squash as croutons, you can add them at the very end instead of tossing with the salad and eliminate the micro greens or sprouts, since the croutons will be the garnish. 1. Wash and grate the cabbage. Place in a small bowl. Scrub and grate all the root veggies except radishes. Cut separately and place in separate bowls. 2. Wash and cut radishes into circles or wedges and place in a small bowl. 3. Dice the pickle and place in a bowl. 4. To assemble the salad, spread grated purple cabbage on the plate in a circle form. Then add grated yellow beet on top, but leave a rim of purple from the cabbage. Next, add, grated carrot, leaving a rim of the beet. Finally, sprinkle the diced pickle over the grated veggies. 5. Add slices or wedges of whatever radishes you are using. Add a pinch of Kosher salt. Sprinkle olive oil on all the veggies. Do not toss. The person eating the salad can toss the different veggies together on his or her plate. P.S. The recipe posting before this featured potato pancakes (latkes) and I promised I would report back when we made them, because I was going to try to make sweet potato latkes. 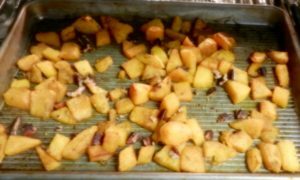 I did, adding an egg because sweet potatoes are not as wet as white potatoes when they are grated. 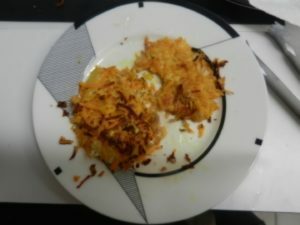 The result was a cross between a sweet potato omelet or scrambled eggs with grated sweet potatoes. I’ll stick to white potatoes! This entry was posted on Sunday, December 17th, 2017 at 6:45 pm	and is filed under Home Page, Kitchen Nutrition. You can follow any responses to this entry through the RSS 2.0 feed. You can skip to the end and leave a response. Pinging is currently not allowed.